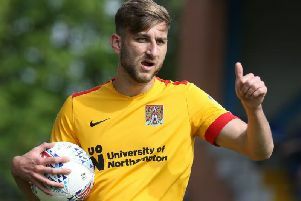 Outs and doubts: Cobblers: Shaun McWilliams, George Cox, John-Joe O’Toole, Ash Taylor, Sam Foley. Morecambe: A-Jay Leitch-Smith, James Sinclair, Andy Fleming, Aaron Wildig, Barry Roche, Lamin Jagne, Florent Cuvelier, Vadaine Oliver. Possible line-ups: Northampton (3-5-2): Cornell; Odoffin, Pierre, Facey; Hoskins, Turnbull, J Williams, Bridge, Buchanan; Morias, A Williams. Morecambe (3-5-2): Halstead; Sutton, Lavelle, Old; Mills, Tutte, Cranston, Conian, Mandeville; Oates, Ellison. Opposition view: “It’s a very difficult job and I’m not happy with certain things but we’ve got to keep battling and keep going,” said Shrimps boss Jim Bentley on his side’s poor run of form. “I’ve said to the players that, if they start pointing fingers, that’s when they’re going to be struggling. James Heneghan’s preview: The outcome of tomorrow’s League Two encounter between two out-of-form, injury-ravaged teams at the PTS Stadium will likely determine whether or not the Cobblers are officially in a relegation battle this season. With play-offs now firmly out of the equation, Northampton are currently hovering on the edge of the dogfight that’s going on beneath them. Victory against a free-falling Morecambe side on Saturday should allay fears of being dragged into that battle. But defeat, on the other day, will have the alarm bells ringing loud and clear and leave Keith Curle’s men facing an anxious, unnerving finish to the season. This weekend’s game is made all the more important when you consider Town’s next three fixtures are all against teams in the top 10, including a trip to league leaders Lincoln City. The growing concern among fans does not solely stem from Town’s proximity to the bottom two; it’s also their ongoing loss of form that now spans almost three months and 14 games, of which they’ve won just two. Couple that with the increasingly depleted squad Keith Curle has to pick from and you have all the ingredients of a team in a relegation battle. Injuries are piling up for Curle who could be without five key players this weekend, but that can’t be used as an excuse for this particular match given the remarkable extent of Morecambe’s problems with the visitors potentially missing eight first-team options for their long trip south. Young Jay Williams could make his fourth straight start and perhaps Jordan Turnbull may also slot into central midfield should McWilliams, Foley and O’Toole all miss out, but it’s hardly an ideal situation with just six days of the window remaining. Morecambe’s injury-list includes the match-winning from the reverse fixture. A-Jay Leitch-Smith’s strike in first-half injury-time at the Globe Arena was enough to sink Town, who failed to score even when goalkeeper Barry Roche was dismissed and outfield player Alex Kenyon donned the gloves. Morecambe overcame a dreadful start to the season – losing nine of their first 10 matches (their solitary win, incidentally, coming in that game against Northampton) – to move clear of the relegation zone, but one victory in their most recent 10 league fixtures has left them just one place and one point above Sol Campbell’s resurgent Macclesfield. Like the Cobblers, the Shrimps are also coming off a crushing last-minute defeat, beaten by Luke Wilkinson’s stoppage-time goal in their home clash with Stevenage last Saturday. With Northampton suffering a similar fate at Cambridge, the pressure has ramped up a notch or two this weekend.